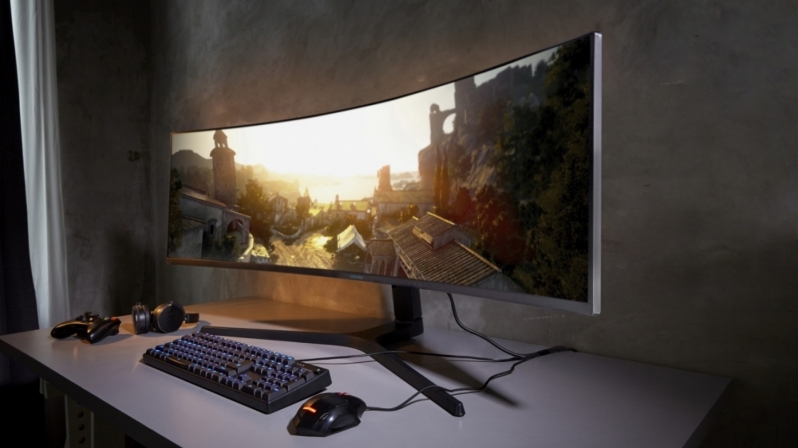 With their latest C49RG90SSU Ultra-wide PC display Samsung plans to push a lot of boundaries, pushing resolutions, refresh rates and HDR capabilities to their limits. We have seen 32:9 monitors before, dual-wide displays that typically offers a 2x1080p viewing experience, but not this time. Samsung has upped the ante by delivering a resolution of 5120x1440, a 2x1440p resolution with a staggering 120Hz maximum refresh rate. On top of that, the display support FreeSync 2 HDR and the has DisplayHDR 1000 certification, both of which are good signs for gamers and viewers of other HDR content. Samsung also promised strong local dimming with this display, but we do know that the monitor uses an edge-lit backlight, which will limit the screens HDR capabilities somewhat, but even with that the screen should offer users a great HDR experience, especially with FreeSync 2 HDR enabled applications. Thanks to the C49RG90SSU's FreeSync 2 support, we know that the screen supports variable refresh rates with a wide VRR range and offers low latency inputs for gaming PCs. On the screen side, we know that Samsung is using a curved QLED display panel, which supports 95% of the DCI-P3 colour space and offers a 4ms grey-to-grey response time. The screen itself is 49 inches in size, offering a 1,800mm screen curvature, making the screen ideal for both office use and by gamers (an ultra-wide 49-inch flat panel would not be comfortable to look at). Input-wise the screen offers two DisplayPort 1.4 connections as well as a single HDMI port. USB 3.0 and headphone connectivity options are also available. At Overclockers UK, the Samsung C49RG90SSU is available to pre-order for £1249.99. At this time it is unknown when pre-orders will be fulfilled. You can join the discussion on Samsung's Insane 49-inch CRG9 5120x1440 120Hz FreeSync 2 HDR Display on the OC3D Forums.